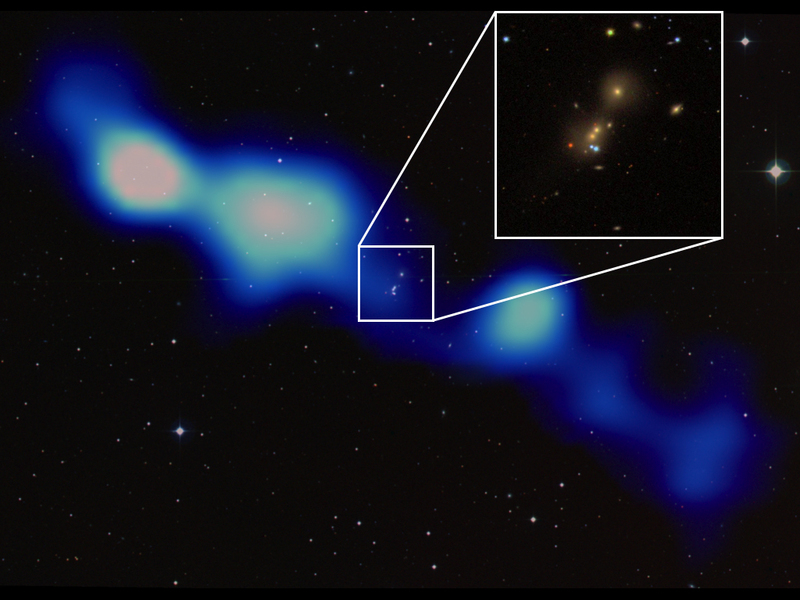 19 March 2013, Dwingeloo, the Netherlands – A team of astronomers led by ASTRON astronomer Dr. George Heald has discovered a previously unknown gigantic radio galaxy, using initial images from a new, ongoing all-sky radio survey. The galaxy was found using the powerful International LOFAR Telescope (ILT), built and designed by ASTRON. The LOFAR telescope is an important scientific and technological pathfinder for the world’s largest radio telescope – the Square Kilometre Array (SKA). The team led by Dr. Heald is currently performing LOFAR’s first all-sky imaging survey, the Multi-frequency Snapshot Sky Survey (MSSS). While browsing the first set of MSSS images, Dr. Heald identified a new source the size of the full moon projected on the sky. The radio emission is associated with material ejected from one member of an interacting galaxy triplet system tens to hundreds of millions of years ago. The physical extent of the material is much larger than the galaxy system itself, extending millions of light years across intergalactic space. The MSSS survey is still ongoing, and is poised to discover many new sources like this one. Overlay of the new GRG (blue-white colors) on an optical image from the Digitized Sky survey. The inset shows the central galaxy triplet (image from Sloan Digital Sky Survey). The image is about 2 Mpc across. LOFAR’s MSSS survey is a concerted effort to image the entire northern sky at very low radio frequencies, between 30 and 160 MHz (wavelengths from 2m to 10m). The primary aim of the survey is to perform an initial shallow scan of the sky, in order to create an all-sky model that will support the calibration of much deeper observations. It is comparable in sensitivity and angular resolution to previous surveys with ‘classical’ radio telescopes like the Very Large Array (VLA) in the USA, ASTRON’s Westerbork Synthesis Radio Telescope (WSRT), and the Giant Metrewave Radio Telescope (GMRT) in India. MSSS is unique in that it operates at substantially lower frequencies, and is therefore poised to uncover new sources that were missed by previous surveys. Its broad bandwidth coverage is also novel in all-sky radio surveys, and will be used to provide additional information about the detected objects. ASTRON is the Netherlands Institute for Radio Astronomy, part of the Netherlands Organisation for Scientific Research (NWO). Its mission is to make discoveries in radio astronomy happen, via the development of novel and innovative technologies, the operation of world-class radio astronomy facilities, and the pursuit of fundamental astronomical research. See also: www.astron.nl.